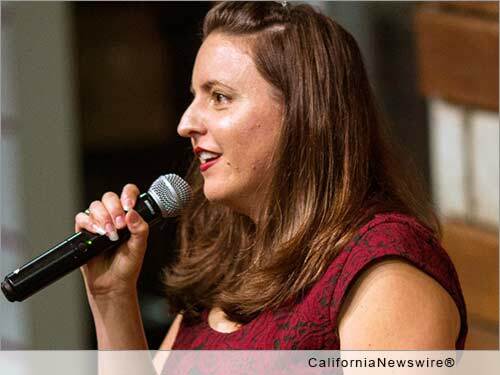 ALAMEDA, Calif. /California Newswire/ — Nina G bills herself as "America's Only Female Stuttering Comedian." Less obvious about this stand-up comedian, social activist, and author, is that she also has a learning disability. Both Nina G's stutter and her learning disability are subjects in her new one woman show, "Going Beyond Inspirational," which premieres on (funnily enough) April Fools' Day! April 1, 2015 at the Pacific Pinball Museum in Alameda, Calif. In a world where people with disabilities are often portrayed solely as being inspirational, or are otherwise presented through the filter of perceptions of people without disabilities, Nina's latest offering is a refreshingly authentic representation. An intensely personal work, Going Beyond Inspirational is based on Nina's own life experiences, with herself as the messenger. And Nina G has a lot to say! The show covers everything from how Nina struggled in school, to learning from her parents what in means to be an advocate, to finding her voice, both as a woman with disabilities and as a stand up comedian. Going Beyond Inspirational is carefully crafted in a way that validates the disability experience for both the people with and without disabilities. Nina G has been challenging attitudes about disability since she did stand-up for the first time in 2010. "How many people with disabilities does it take to screw in a light bulb?" Answer: "One to screw it in and 5 able bodied people to say 'You are such an inspiration!'" This joke is a favorite in Nina G's stand-up routine. It brings to light (no pun intended) the struggle people with disabilities have in an able -bodied society that reduces them to images of "inspirations" and "overcomers." Her solo piece came about as Nina G increasingly got requests to do longer shows and to perform at colleges. In developing her material, Nina weeded out bits of her nightclub act that would not be appropriate for such venues. In the process, Nina also discovered that she wanted her life experiences to go beyond fodder for jokes and punch lines; she wanted them to become teachable moments for audiences that validate the disability experience. And so, her one woman show, Going Beyond Inspirational, was born. "I really wanted to have some kind of avenue to talk about some of the things in my life and to take a longer time to delve into those experiences. This show gives me that opportunity," says Nina. Always striving to balance her strong activist voice with a good dose of comedy, Nina says, "There is an ongoing struggle of tending to be preachy but wanting to be funny at the same time. I think that's a balance that I really need to have." Nina goes on to emphasize: "For the topic of disability it's especially important to utilize humor as a tool to open up dialogue, because people's defenses are so high." Nina finds that people don't want to talk about disabilities, which is ironic because, as she points out, "The Disabled Community is one of the few minority groups that people can join at absolutely any time in their life." Nina's new one-woman show Going Beyond Inspirational, premiers on (funnily enough) April Fools' Day! April 1, 2015 at the Pacific Pinball Museum, 1510 Webster St., Alameda, CA. Admission is $15 for Adults, and includes pinball play. Doors open at 7pm. From there the show goes on tour Nationally. For more information on tickets and tour dates, visit http://www.beyondinspirational.com/ . The Pacific Pinball Museum is a 501(c)(3) nonprofit dedicated to teaching art, science and history through pinball, and to preserve and promote this important part of American culture. The interactive museum showcases 100 pinball machines ranging from 1898 to today, hand-painted murals of pinball backglass art, and exhibits utilizing pinball technology to demonstrate science principles. To find out more about the PPM, visit: http://www.pacificpinball.org/ .